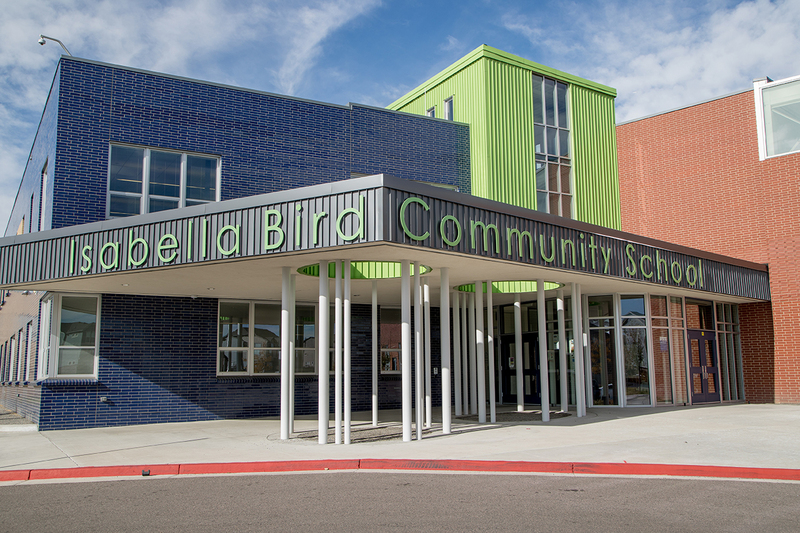 Isabella Bird Community School was founded by Sonny Zinn, Traci Bushnell and Jeff Bushnell. The school opened in a temporary location in the Fall of 2013 with only 89 students in Kindergarten and 1st grade. During the first school year, construction began on our beautiful building in Stapleton. The architecture of the building encourages the connection between the inside and nature. One wall of the cafeteria has a floor-to-ceiling window and a glass garage door that opens so that kids can eat inside or out. When the divider is up between the cafeteria and the music room next to it, the combined area becomes a community room for assemblies and performances. In the Summer of 2014 we moved into our permanent location and opened in the Fall with 334 students in ECE-5th grade. We will reach full expansion in our building for the 2018-2019 school year. Why the school is named for Isabella Bird: Isabella Lucy Bird (1831-1904) was a well-educated English explorer, author and naturalist. She lived a life unlike most other women of the Victorian era. She circumnavigated the globe three times, including 800 miles by horseback through the Colorado Rockies. Her pioneering spirit as a female role model who traveled extensively, wrote about her experiences, spoke out strongly against the discrimination she witnessed, and demonstrated compassion for the poorest societies of the world, along with so many of her other life experiences, apply to classroom teachings about travel, courage, deep reflection, international citizenship, celebrating diversity, and what it means to be a strong learner and a global thinker. The choice of Isabella Lucy Bird is intended to inspire future explorers, dreamers and trail blazers to do great things, well beyond the boundaries of the school’s walls. In the end, she personifies the school’s goal to promote learning for a more informed, compassionate, and unified global humanity. Isabella Bird Community School’s mascot: After careful thought, and for a number of reasons, the dragon was selected as Isabella Bird Community School’s mascot. Nearly everywhere in the world, and from nearly every culture there are stories of dragons that appeal to children of all ages. Our students, who come from all over the world, can find something familiar in the dragon. The tale’s children bring with them, like the animal itself, are filled with imagination and mystery. Dragons invite opportunities for rich cultural discussion, study and learning. They also invite a host of perspectives and interpretations. Some people assert that the dragon is real, others not. Some cultures believe it to be fierce and unkind, while others recognize it as gentle and benevolent. Like dragons, students show up at school in many forms, and thus, each student can find him or herself on any given day in one or more of the dragons made famous through tales told around the fire and through storybooks. We are certain Isabella Bird would appreciate a school mascot that reflects the stories and cultures of the many people she encountered, was inspired by, and wrote about.